I've finally begun to shed layers at the farm. My fleece hat is now optional instead of required and my fleece coat is far too hot now underneath my raincoat. It's taken more than a month to feel "hot" only because it's just been that cold outside. On Wednesday, Sally needed some assistance planting five rosemary bushes at the Herbfarm restaurant garden. When I arrived, Sally had already started on the rosemary hedge. How brilliant, really- in the future, instead of planting a non-edible green bushy hedge for a border, why not rosemary? And what a sensory experience to plant rosemary bushes. The variety of rosemary we planted was called Tuscan Blue. “'Tuscan Blue' is a fast growing rosemary with a tall upright habit. The flowers are dark blue, the slightly glossy foliage is light green against red-brown stems. Height and spread are 3-6'. Dense, bushy, upright, aromatic evergreen shrub. Leaves are narrow and linear, dark green and leathery, up to 2 inches long. Small, tubular blue flowers in whorls, up to 1/2 in long. 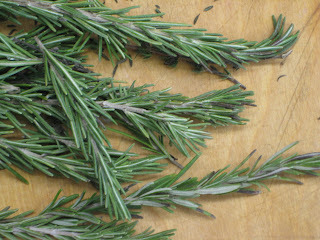 Rosemary is an excellent choice for making topiaries, and widely used in cooking especially Italian cuisine. A wonderful companion plant with roses." Ironically, my first true encounter with the hypnotic scent of rosemary was working as a pastry chef's assistant at age 16 at Il Bacio, an Italian pastry shop. Tuscan pastry chef, Roberto would make focaccia bread from scratch every day, drizzled in olive oil and sprinkled with crunchy sea salt and rosemary. No doubt, the best $2.00 ever spent on bread. Even though I was in Redmond, I could have been in any cafe in Tuscany. For the five gallon rosemary bushes we planted, we had to dig into the soil far enough to reach a hard clay layer. This layer needed to be broken up to help the plant's roots stretch out and to help with drainage. The rosemary bushes had grown into their pots- their compact root system looked like a woman's long hair after she has taken the towel off from the shower- moist, tight strands molded to her head. Before we placed the roots into the ground, we cut a small layer off the bottom of the bush and pulled and broke up some of the strands. Similar to cutting the bottom stems off flowers before placing them in a vase of water, we encourage the rosemary roots to get comfortable to the new surroundings. Once the hole was ready, just before adding the plant, we added a little compost soil to the bottom of the hole, a couple handfuls of fertilizer and a sprinkling of lime and mixed well. While placing the rosemary bush in the hole and filling it in with soil, it was hard not to keep my face out of its fragrant bushy stems. I’m reminded of pouring water into the base of the Christmas tree stand as a little kid, getting brushed with those heavenly scented pine needles. And it's not just the scent of what you are planting that fills the air, when planting in an herb garden several herbal aromatics take over even the strongest of fertilizers - chives one moment and thyme the next.